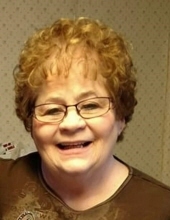 Myrtle A. Reynolds, 74, of Fostoria, passed away on Sunday, December 2, 2018, at ProMedica Toledo Hospital, in Toledo. She was born February 8, 1944, in Abilene, Texas to Charles and Isabelle (Ireland) Close. She married David R. Reynolds, her loving husband of 52 years, at the Church of Christ in Bradner, and he survives her. Also surviving, and cherishing her memory, are her three children, Sherri (Jerome Crum) Reynolds, of Gibsonburg, Jennie Reidel, of Fort Wayne, Indiana , and Shawn (Linda) Reynolds, of Findlay; numerous grand and great-grandchildren; two sisters, Sandra Euler, of Tontogany and Barb Hillard, of Weston; and two brothers, Chuck Close, of Tontogany and Bob Close, of Bowling Green. She was preceded in death by her parents and a niece, Brittany Hillard. Myrtle was a 1964 Bowling Green High School graduate. A wonderful homemaker, she enjoyed a simple, quiet existence, spending time with her family camping, traveling, motorcycle riding, and simply going to get her hair done. She and David used to show horses at the Ohio State Fair. The most important thing to her in life was her children and grandchildren. Visitation will be held from 9 am -11 am on Friday, December 7, 2018 at MANN-HARE-HOENING Funeral Home, 407 N. Countyline St., Fostoria. Funeral services will begin in the funeral home at 11 am, followed by committal services and burial at Zion Lutheran Cemetery, Jackson Township. Memorial contributions may be considered to The Shriners Hospital for Children, 8048 Broadstone Blvd., Perrysburg, OH 43551. Online expressions of sympathy may be made by visiting www.hoeningfuneralhome.com. To send flowers or a remembrance gift to the family of Myrtle A. Reynolds, please visit our Tribute Store. "Email Address" would like to share the life celebration of Myrtle A. Reynolds. Click on the "link" to go to share a favorite memory or leave a condolence message for the family.